Chasing Roots: Photography: the Rule of Thirds. And Bobbers. I've never been a big fan of fishing. Growing up my dad would take my little sister and me fishing at the creek just down the block from our house. It always took what seemed like HOURS to gather all of our fishing gear (including our child-size Snoopy fishing poles), walk to the creek, and bait our hooks. If we also had to drive or bike to the bait shop the preparation might as well have taken DAYS. I also don't like worms, which were my dad's bait of choice. And I don't like mosquitoes, which are the state bird of Wisconsin. So fishing was a real kick for me. I did, however, really like bobbers. Especially bobbers that have been cut loose from their lines and have drifted far from their original points of entry into the water. When as a child I lost interest in sitting and waiting for fish, I'd sort all of the colorful bobbers in my dad's tackle box. Once the bobbers were organized I'd walk the shoreline of the creek, gathering and setting free bobbers that had lodged between the rocks or become tangled in the weeds and lily pads. And then I'd watch those bobbers drift away, headed toward their next adventure. As it turns out, I still find bobbers incredibly interesting, especially as subjects in photography. This bobber was floating peacefully in the man-made pond outside the George H. W. Bush Museum and next to the Barbara Bush rose garden. This bobber was nearly drowning in a dirty, drought-burdened pond at a park in College Station. As I uploaded these photos to Picasa, I noticed that in both photos the bobber is not centered. I wasn't sure why I'd photographed the bobbers that way; I only knew that I thought the pictures looked more interesting with the bobbers off to the side. Last week I took my very first photography class. We learned primarily about our cameras, and how to use them instead of them using us, but at the end of class the instructor touched on photo composition and the Rule of Thirds. 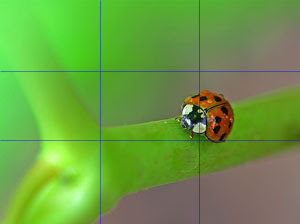 According to Wikipedia, the Rule of Thirds is a compositional, visual arts rule of thumb stating that an image should be imagined as divided into nine equal parts by two equally-spaced horizontal lines and two equally-spaced vertical lines, and that important compositional elements should be placed along these lines or at their intersections. Aligning subjects at these points creates more tension, energy, and interest than simply centering the subject would. My instructor explained that our eye enters a picture in the upper left-hand corner and exits a picture in the lower right-hand corner, just as our eye reads from upper left to lower right on a page of a book. Because of this learned eye movement, the upper-left compositional point is strongest, followed by the lower-right compositional point and the lower-left compositional point. The weakest compositional point is the one in the upper right. I immediately envisioned my bobber photos, understanding at that point why I'd positioned the bobbers off-center. I am an analytical, organized thinker, usually excelling in areas that require following directions and rules and always failing miserably in areas that require abstract thinking and creativity. Understanding the Rule of Thirds allows less-than-creative people like me to take artistic photos - a small victory for us left-brainers! I haven't had time to take any pictures (of bobbers or anything else) since learning about the Rule of Thirds, so I thought I'd leave you with a few I took earlier this summer that seem to demonstrate the Rule's power. The third picture below is one of my all-time favorites - my darling daughter's determined face, as she climbed to the top of the jungle gym all by herself for the very first time, is positioned at the lower-right compositional point of the picture and the deepest, warmest point in my heart.